PDD's Origin Revealed ! Click Here ! What's a Pimp Daddy Destro? It's How Valuable? How Rare? Is it Real? Is it Fake? How To Tell! Have Info to Contribute? Contact me! The Definitive G.I. Joe " Pimp Daddy Destro " Action Figure Resource. Welcome All! And what the heck is a Pimp Daddy Destro anyway??? Origin of the PDD - 1st Time Made Public! It's HOW Valuable? HOW Rare? Holy Cow!!! All informational content copyright 2016 ProjectPDD.com. Informational content (audio, visual & textual)reported on this website cannot be reprinted, used, referred to, copied, paraphrased, rewritten or posted on any other website or through any other means; except with express written permission from the ProjectPdd.com administrator. By using this site, you signify your agreement & understanding of these conditions. If you do not agree to these conditions, do not use this site. G.I. 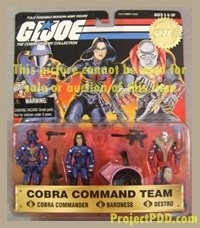 Joe , Cobra , Destro and related names, characters, images, trademarks, and logos are fully protected by trademark rights, copyrights and other rights owned by Hasbro Industries. Support Hasbro by purchasing their current G.I.Joe products!